Geologists get a wide range of information from fossils. They help us to understand evolution and life in general; they provide critical information for understanding depositional environments and changes in Earth’s climate; and, of course, they can be used to date rocks. Although the recognition of fossils goes back hundreds of years, the systematic cataloguing and assignment of relative ages to different organisms from the distant past — paleontology — only dates back to the earliest part of the 19th century. The oldest undisputed fossils are from rocks dated around 3.5 Ga, and although fossils this old are typically poorly preserved and are not useful for dating rocks, they can still provide important information about conditions at the time. The oldest well-understood fossils are from rocks dating back to around 600 Ma, and the sedimentary record from that time forward is rich in fossil remains that provide a detailed record of the history of life. However, as anyone who has gone hunting for fossils knows, that does not mean that all sedimentary rocks have visible fossils or that they are easy to find. Fossils alone cannot provide us with numerical ages of rocks, but over the past century geologists have acquired enough isotopic dates from rocks associated with fossil-bearing rocks (such as igneous dykes cutting through sedimentary layers) to be able to put specific time limits on most fossils. A very selective history of life on Earth over the past 600 million years is provided in Figure 8.10. The major groups of organisms that we are familiar with evolved between the late Proterozoic and the Cambrian (~600 Ma to ~520 Ma). Plants, which evolved in the oceans as green algae, came onto land during the Ordovician (~450 Ma). Insects, which evolved from marine arthropods, came onto land during the Devonian (400 Ma), and amphibians (i.e., vertebrates) came onto land about 50 million years later. By the late Carboniferous, trees had evolved from earlier plants, and reptiles had evolved from amphibians. By the mid-Triassic, dinosaurs and mammals had evolved from very different branches of the reptiles; birds evolved from dinosaurs during the Jurassic. Flowering plants evolved in the late Jurassic or early Cretaceous. The earliest primates evolved from other mammals in the early Paleogene, and the genus Homo evolved during the late Neogene (~2.8 Ma). If we understand the sequence of evolution on Earth, we can apply knowledge to determining the relative ages of rocks. This is William Smith’s principle of faunal succession, although of course it doesn’t just apply to “fauna” (animals); it can also apply to fossils of plants and those of simple organisms. The Phanerozoic has seen five major extinctions, as indicated in Figure 8.10. The most significant of these was at the end of the Permian, which saw the extinction of over 80% of all species and over 90% of all marine species. Most well-known types of organisms were decimated by this event, but only a few became completely extinct, including trilobites. The second most significant extinction was at the Cretaceous-Paleogene boundary (K-Pg, a.k.a. the K-T extinction). At that time, about 75% of marine species disappeared. Again, a few well-known types of organisms disappeared altogether, including dinosaurs (but not birds) and the pterosaurs. Other types were badly decimated but survived, and then flourished in the Paleogene. The K-Pg extinction is thought to have been caused by the impact of a large extraterrestrial body (10 km to 15 km across), but it is generally agreed that the other four Phanerozoic extinctions had other causes, although their exact nature is not clearly understood. As already stated, it is no coincidence that the major extinctions all coincide with boundaries of geological periods and even eras. Paleontologists have placed most of the divisions of the geological time scale at points in the fossil record where there are major changes in the type of organisms observed. If we can identify a fossil to the species level, or at least to the genus level, and we know the time period when the organism lived, we can assign a range of time to the rock. That range might be several million years because some organisms survived for a very long time. If the rock we are studying has several types of fossils in it, and we can assign time ranges to those fossils, we might be able to narrow the time range for the age of the rock considerably. An example of this is given in Figure 8.11. Some organisms survived for a very long time, and are not particularly useful for dating rocks. Sharks, for example, have been around for over 400 million years, and the great white shark has survived for 16 million years, so far. Organisms that lived for relatively short time periods are particularly useful for dating rocks, especially if they were distributed over a wide geographic area and so can be used to compare rocks from different regions. These are known as index fossils. There is no specific limit on how short the time span has to be to qualify as an index fossil. Some lived for millions of years, and others for much less than a million years. Some well-studied groups of organisms qualify as biozone fossils because, although the genera and families lived over a long time, each species lived for a relatively short time and can be easily distinguished from others on the basis of specific features. For example, ammonites have a distinctive feature known as the suture line — where the internal shell layers that separate the individual chambers (septae) meet the outer shell wall, as shown in Figure 8.12. These suture lines are sufficiently variable to identify species that can be used to estimate the relative or absolute ages of the rocks in which they are found. Foraminifera (small, carbonate-shelled marine organisms that originated during the Triassic and are still around today) are also useful biozone fossils. As shown in Figure 8.13, numerous different foraminifera lived during the Cretaceous. Some lasted for over 10 million years, but others for less than 1 million years. If the foraminifera in a rock can be identified to the species level, we can get a good idea of its age. 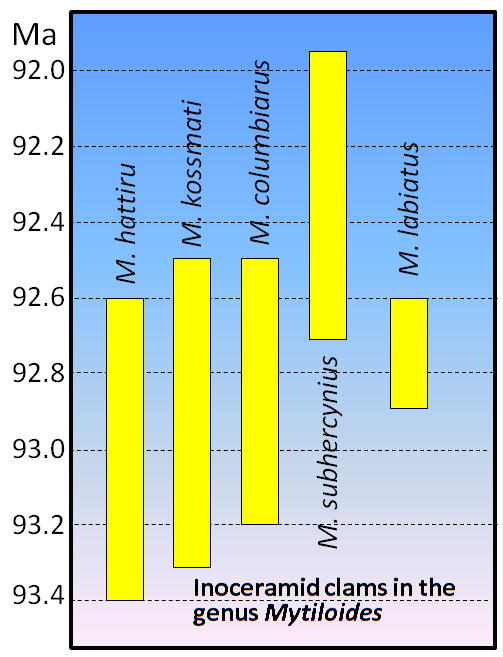 This diagram shows the age ranges for some late Cretaceous inoceramid clams in the genus Mytiloides. 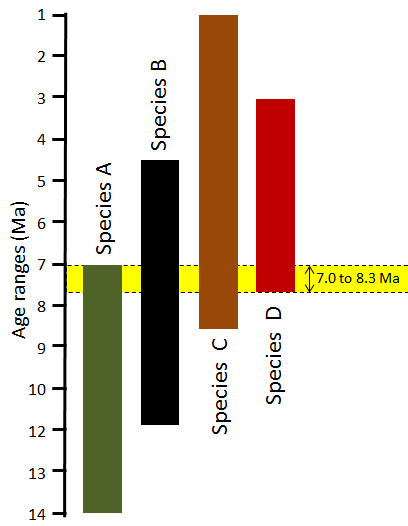 Using the bracketing method described above, determine the possible age range of the rock that these five organisms were found in. How would that change if M. subhercynius was not present in these rocks? 8.3 Dating Rocks Using Fossils by Steven Earle is licensed under a Creative Commons Attribution 4.0 International License, except where otherwise noted.